Mother’s Day is just around the corner, and we know it can be difficult to find the perfect gift that your mom deserves. If you’re all out of ideas, or left gift shopping to the last minute, Matte PR has you covered. We’ve rounded up some great gift ideas to spoil your mom with this year. Have a look for your #MothersDayInspo. Pop over to Hillcrest to pick up this some seasonal beauty goodies – is mom a fan of florals? Shop Aerin’s new budding fragrance collection from Sephora. Or add a pop of pastel to her spring wardrobe with the pretty pink bomber jacket by Soia & Kyo, available at Sporting Life. Treat your mom to a day at the salon! The Sassoon team in Yorkville will tailor her look, considering her unique features and hair needs to create the ultimate style that is easy to maintain. 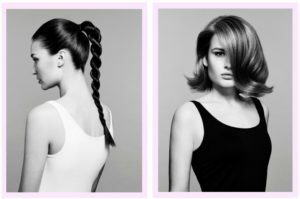 Sassoon’s SS17 Blow & Style menu includes classic and edgy styles for every mom. The Rope Pony is a modern, runway-inspired twist on the standard ponytail, while Luxe Volume exudes glamour and sophistication. NOPAULAGIES is a fashion brand specializing in superior quality athleisure wear that makes a statement. The brand is designed for the intelligent, stylish woman who enjoys an active, multi-faceted lifestyle (and some feminist word play!). We absolutely adore every design by NOPAULAGIES, and we think your mom will too. We think that a last minute online order is definitely worth the wait. Bring light into mom’s home with a playful new home décor piece. We recommend the stunning Chroma Curio shelf by Vancouver-based designer Annie Tung. This acrylic wall object brings a shifting rainbow to interiors using light, reflection, and colour. The unicorn-like hues will transform mom’s home into a fun, whimsical space. If you’re feeling extra generous, move your mom into a new home! International luxury real estate firm Engel & Völkers can hook you up with some of the most beautiful homes and condo units across the GTA. Need somewhere to take mom this winter? Splurge on a new vacation home: Engel & Völkers can connect you with other brokerages in sunny destination like Miami, Phoenix, Belize, and Cayman Islands. We hope our list helped you decide how to spoil your mom this year! Have a great Mother’s Day, from all of us at Matte PR.